Avaldsnes is believed to have been named after the legendary King Augvald, who allegedly had his seat in Karmsundet. There had been an ancient centre of power at Avaldsnes. The shipping lane is forced into a narrow passage just by Avaldsnes. It is probably the shipping traffic on the strait which has generated power and riches through the ages. King Harald Fairhair chose Avaldsnes for his main royal estate in about 870 making it the oldest royal seat in Norway. 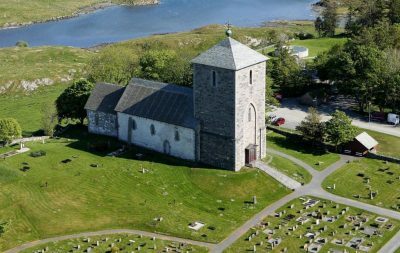 According to legend, Olav Trygvason had a church built at Avaldsnes, apparently as a manor chapel for the king’s residence. This would probably have been a quite small stave church. Construction of the present day church, St. Olav’s Church of Avaldsnes (Norwegian: Olavskirken) was started approximately 1250 AD, on the order of King Håkon Håkonsson. It was not completed until nearly 1320. Dedicated to St. Olav, it was one of the greatest Norwegian stone churches from the Middle Ages and it was one of only four the royal collegiate churches in Norway. The church was an important station of the Pilgrim’s Route to Nidaros which ran along the coast. Rich discoveries from prehistory have been made in the entire area. Reheia – also known as Blodheia – is located approximately one kilometre (1,100 yards) west of the Church. King Harald I of Norway located his main farm at Avaldsnes in about 870. In 953, King Haakon the Good fought a fierce battle at the Bloodheights (Slaget på Blodeheia ved Avaldsnes) against the sons of his half-brother King Eirik Bloodaxe. The forces of King Haakon won the battle and he would reign as King of Norway until his death during 961. This site contains the only Norwegian example of Bronze Age burial mounds lined up in a row. A ship burial from the time of the Merovingian Dynasty (approximately 680-750 AD) found here is presently the oldest ship burial uncovered within the Nordic countries.